Join us for a proper Christmas feast this year. 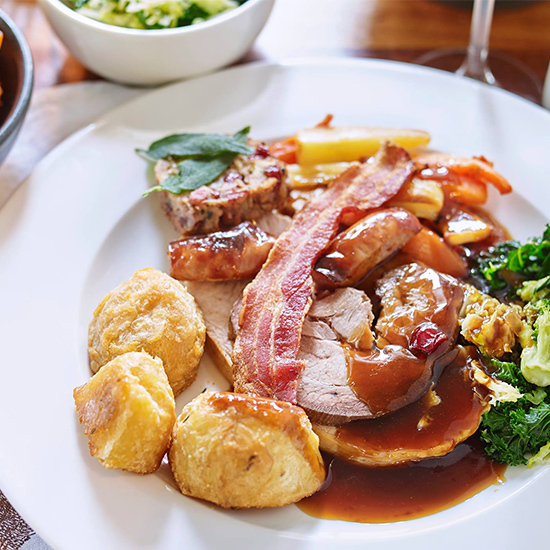 Our turkeys are bronze, free-range birds from Worcester, our beef is British and our fish is always responsibly sourced. It’s not just about the Turkey, it’s about the whole occasion and we want to make sure your party is magical from the moment you step into the pub. The fires will be lit, mulled wine will be gently simmering on the bar, buttery mince pies stacked up in the kitchen and Santa hats are on the table for every guest (wearing them is obligatory). 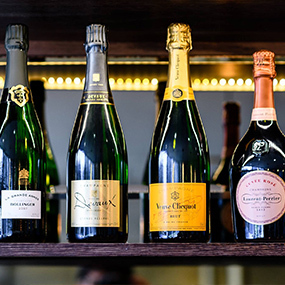 There’s a list of award-winning wines and bubbles to choose from too, all you need to do is gather your friends, family or work mates. 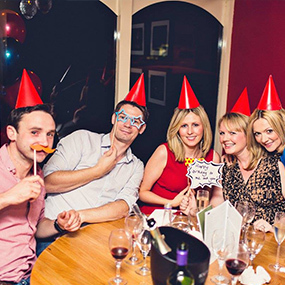 For parties up to 10, call or book your table online. For groups over 10, please submit an enquiry. If you’re looking for a private space to host a festive lunch or dinner party, book our Private Dining Room, and we’ll treat you like Kings (of Orient Are). Book a table for lunch or dinner between Wednesday 28th November and Sunday 9th December and enjoy three courses from our Christmas menu for the price of two. 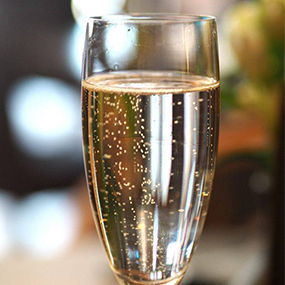 For parties dining from our Christmas menu between 5.30pm-6.30pm any day right up to Christmas Eve, enjoy a glass of Prosecco each on us. 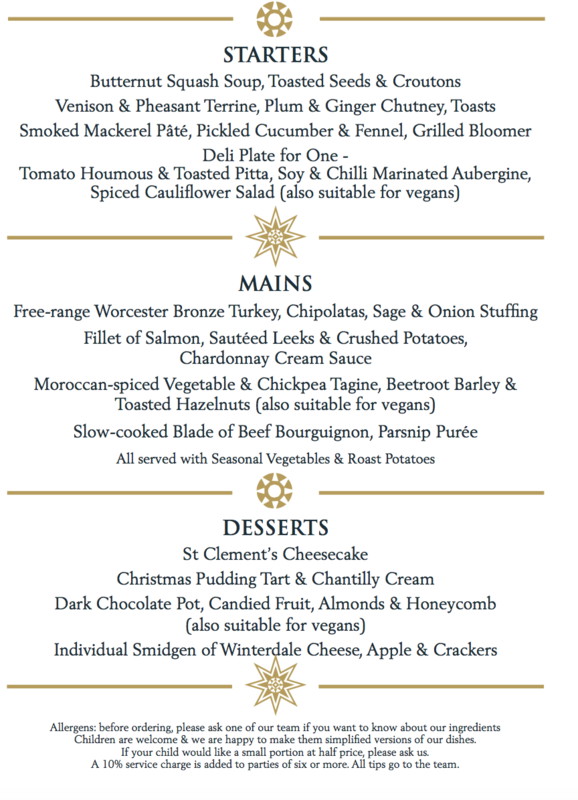 Our Christmas Menu is served from 28th November until Christmas Eve. We aren’t open on Christmas Day. We believe everyone should have the day off to stuff themselves with turkey and then gently nod off in front of the fire. We’ll be back open on Boxing Day. We will collect your credit card details and store them in our secure electronic credit card vault. No charge will be made at time of booking or without contacting you. In the unfortunate event you need to cancel your reservation please tell us by email (christmasthatch@peachpubs.com) or in writing as soon as possible. Please be aware we require a minimum of 48 hours’ notice of any cancellation. For cancellations of less than 48 hours of the party date, £10 per person will be charged to the card details given. All of our dishes are prepared in house, and we’re happy to suit any dietary needs, just remind us on your pre order form in advance of your booking. We're ready and eager to help host your Christmas party. For parties over 10, contact us using the button below. We'd love you to join us for one of our Christmassy events throughout December. Treat your loved one to a gift voucher for their favourite local this Christmas.